Essentially, the Wheel of Life is divided into different areas or categories that are important to you. 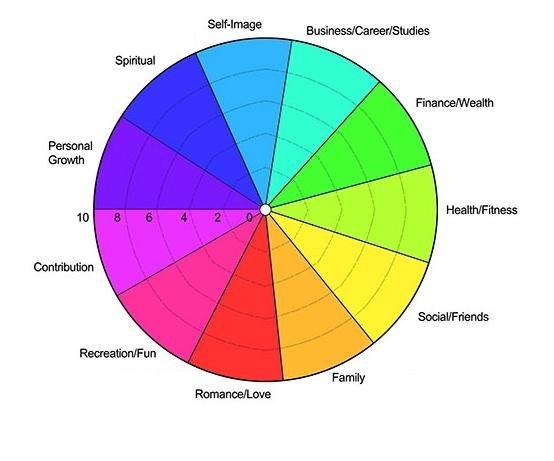 What you see above is a common example of the Wheel of Life, split into major categories of life including Business/Career, Finances, Health, Family & Friends, Romance, Personal Growth, Fun & Recreation, and Physical Environment. There is a scoring system behind using the Wheel, where you simply reflect and rate your satisfaction levels out of 10, where 1 is closest to the centre of the circle and 10 is at the edge of the circle. The above diagram is colour-coded to simplify it and also make it aesthetically pleasing… feel free to change this as you wish! Note that the categories on the Wheel are a suggestion. You will find that with the above you will be able to score yourself in the majority of key areas in your life. However, before you rush into it and complete the Wheel, you may like to have thought whether there are any other categories or specific areas you would like get an understanding of, such as Spirituality or Contribution to Society. Perhaps you may want to have Family & Friends as two separate categories to understand each more specifically. Below is an example of what your Wheel of Life may look like. Remember, this about you simply finding Happiness and Balance in your life so it will need to be clear and simple for you to understand. One of the biggest benefits of the Wheel of Life is the pictorial representation it gives of your satisfaction with life. When your Wheel is completed, it will give you a spider-like diagram or ‘inner-circle’ of your satisfaction levels and allows you to quickly and easily identify any gaps between where you are now and where you want to be. Now that you understand the building blocks of the Wheel, let’s go ahead and actually do it now! Print off one of the above Wheels to use as a template, or simply draw your own on a piece of paper. Additional templates and guidance can be found in the Happiness Toolkit. 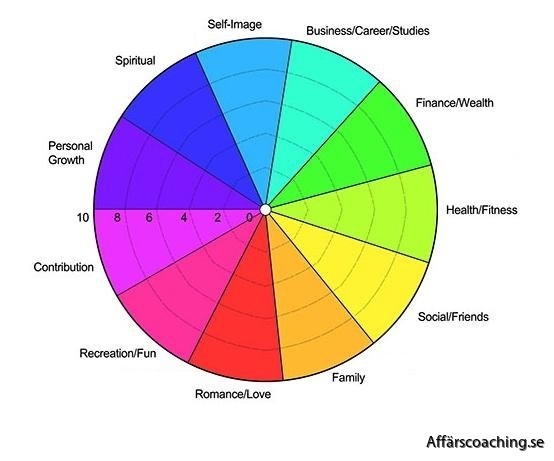 Score your satisfaction levels against each of the different categories you have on your Wheel. Take your time doing this, I would recommend 15 minutes or so. Put yourself in a place with no distractions and reflect on your life as a whole. To help you with this exercise I have provided some thought prompter’s. Business, Career & Studies: Is your career where you want it to be by now? Are you heading in the right direction? Finance & Wealth: Are you earning enough income to satisfy your current needs? Are you financial setup for future growth in wealth? Health & Fitness: How physically healthy are you? Are you satisfied with your level of fitness? Are you satisfied with your diet? Social & Friends: Are your friends supportive of you? Are you engaging friends and socializing to your satisfaction levels? Family: Is your family supportive of you? Are you supportive of your family? Love: Do you feel loved? How often are you expressing love to others? Recreation & Fun: Are you enjoying your life and making it fun? Are you satisfied with the level of activity that you do? Contribution: How would others rate your contribution to society or them as individuals? Personal Growth: How focused are you on personal growth? Are you satisfied with your direction? Are you trying new experiences and seeking to learn? Spiritual: How connected are you to the inner and outer world? Are you satisfied with your relationship with your spiritual being? Self-Image: Do you think of your abilities highly? Do you respect and love yourself? Do you appreciate yourself? You should now have a completed Wheel of Life. It may look something like the below. Take a moment to appreciate your Wheel of Life. What does it look like? Are there any surprises to you? What happens when you try to move forward and you have a crooked wheel? How efficient and effective are you going to be in life if you can not move forward in a balanced way? It is very easy to become extremely satisfied in one area, but at what cost? For example, you can spend all your time and energy working on your career and make some fantastic progress. Perhaps you will even become extremely satisfied with your finances and wealth. However, what may happen to your relationships? Your health and wellbeing? Are you having fun along the way? The key is to find the balance and that is the beauty of the Wheel. To do this, you want to growyour Wheel, not balance your Wheel by trading off in some areas of your life. It’s about moving forward, challenging yourself and pushing your boundaries to expand your Wheel and make itbigger while maintaining a balance. You now have a visual snapshot of how satisfied you are in different areas of your life. Through reflection, you have now identified your biggest gaps between where you are now and where you would like to be. Commit yourself to taking action TODAY. What are the specific actions or steps that you are going to take to enhance your satisfaction in your desired area? Write what you will do down on the same piece of paper that your Wheel is on. Keep your Wheel close by in a place that you can easily refer to on a daily basis. Track your progress! The Wheel provides a snapshot in time of your satisfaction levels and ultimately happiness. Complete the Wheel on a regular basis so you can easily track your progress. I recommend at least once every 6 months, depending on what your goals are and when you have aimed to achieve them. Get access to the Happiness Toolkit and download the Wheel of Life supporting guide andaction plan.